One-time teen idols Hanson are going where few if any teen bands have ever gone before: into solid adult musicmaking. 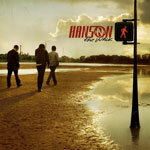 The second release on their own indie label, "The Walk," has more in common with classic era Billy Joel and the Eagles than it does "MMMBop," the smash hit that established them on the national scene as the heirs to the Jacksons and Osmonds as superstar siblings. Now in their late 20s to early 30s, the three Hanson brothers' new album finds them not only still performing together as a group, but also moving into an adult contemporary space. Still anchored by their rich vocal harmonies, the band's music is as accessible and listenable as ever, but it's mellowed since their hitmaking days, slowed a bit. Their ability to write songs with memorable themes that you end up humming the rest of the day remains as intact as their pipes, however. The brothers together and with others wrote all 15 songs (two are reprised in livel acoustic versions at the end of the CD), and if there's no "MMMBop" there, nor are there any real dogs in the bunch. What there is is a ton of solid music.